The word serum conjures up an image of a sticky gel for those who want to fight wrinkles, but a new generation of serums have arrived that are light and easily absorbed, and the Sönd Revitalising Serum for sensitive skin fits that bill. Traditionally serums are active and stimulating, which they have to be in order to boost hydration levels, and reinvigorate the skin renewal system, because that’s how they work. Sensitive skins usually react to such stimulating and concentrated ingredients, and that’s where this product differs—it’s specifically catered for the sensitive skin. This serum aims to firm and smooth the skin, and reduce the appearance of fine lines and wrinkles, while boosting the skins ability to hold moisture. 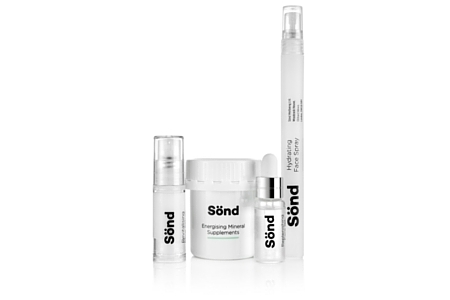 The main ingredient in the Sönd skincare range is silica—a natural mineral (SiO2), which is mined from quartz in Austria and Germany (ethically), which naturally helps the skin to retain moisture, reduces inflammation through silica protecting the skin from free radicals (a free radical in an unstable atom caused by excessive stress, smoking, sun or drugs, and can cause damage to the skin), and can help strengthen collagen in the dermis. That’s the scientific part of it, but how does it feel when you apply it and how does the skin feel afterwards? As I test many serums, I used this on one side of my face and another serum on the other side for a couple of days to see if there was any difference. I was testing a well-known brand on the other cheek and was expecting that one to show results, but was pleasantly surprised to see that the results with Sönd were faster (immediate), and later I opted to use that one on both cheeks to see an overall difference. The product is unfragranced, and the light gel lotion is exceptionally smooth to apply, plus it doesn’t feel heavy, sticky or greasy. Instantly I felt my skin was smoother and that lasted all day, whereas my other cheek felt dry after a couple of hours. I’ve used many premium brand serums and used to sell them myself, and this one is gentle and effective. I’ll be honest; I wasn’t expecting to write a review on this product and goes to show how we can be influenced by the appearance of a product, the name, and the packaging. It’s simply packaged and the name Sönd comes from the German ‘besonders’, which means special as the founder is Austrian (Markus Goess-Saurau). Rating 4.5/5. If you have sensitive skin, or want to switch to products that are ethical and have as few chemicals as possible in them, then I would recommend trying Sönd. All the products are suitable for vegans, don’t contain any fragrance or parabens, and have been tested for all known allergies. On their website a starter kit priced at £25 is available for those who wish to try the whole regimen.